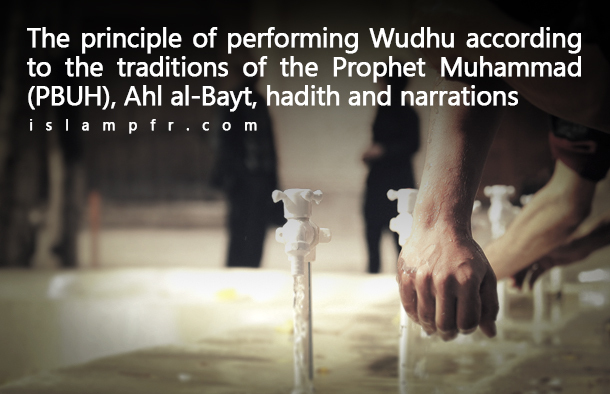 The principle of performing Wudhu according to the traditions (Sunnah) of the Holy Prophet Muhammad (PBUH), Ahl al-Bayt, hadith and narrations. The correction of the narration by the researchers of the book: the researchers of the book, Shoaib- al- Arnot and Adil- Murshad corrected the narration in the foot note and this narration is written in this way. “I supposed that it is proper to rub the sole of the feet rather than its upper surface, until I observed that the Holy Prophet (PBUH) was performing rubbed the upper surface of his both feet”. Nazal-ibn-Sabreh said: “Imam Ali (PBUH) performed the prayer of the noon in the Kuffah square. Then He sat down to solve the people’s problems to the time of evening prayer. They brought him a bowel of water for Wudu, he poured a handful of water on his face than washed his hands and rubbed his head and feet and said ‘I saw Holy Prophet (PBUH) performing wudhu in this way’ [means Holy Prophet(PBUH) used to rub his feet]”. It is an authentic quotation. Al- Mustadrik- Alal –Sahihian. Vol. 1- 36. “But Gabriel rubbed his feet during Wudhu” [i.e. there is a Quranic reference for rubbing feet in Wudhu]. Al-Musannif Abd-ul-razaq, Vol. 1, hadith 56. When Anas was living in Kuffah somone told him that Hajjaj says to wash entire feet in Wudu. God is truthful and Hajjaj is a liar and God has ordered to rub feet in Wudhu. And then in comments of this hadith, ibn-Kathir wrote that above narration was authentic. And he continued that the order of the Holy Quran was to rub the feet. The order about the head and feet are the same. Whether we assume “feet” as “object” or “possessive”, it is in conjunction with the “Head” and it is not permitted to separate two words which are in conjunction. Anyway, in the verse the “feet” are in conjunction with the Head and it implies that we should rub the feet. When a great Sunni scholar whose native language is Arabic, and knows the Arabic grammar very well, says that this verse refers to rub the feet and not washing it, then the question arises that why do other scholars perform otherwise? He possessed high ranks in Islamic knowledge and was regarded as a unique personality in Islam. Sair- aalam- al- nubala, Vol. 18. Imam Baqir (PBUH) said; “When you perform Wudhu, and wash your feet instead of rubbing it, and assume that God ordered you to do that, this Wudhu is not correct.” Then Imam said; “if you want to wash your feet to clean it from sweat and dirt, first rub your feet and complete the Wudhu then wash your feet. But if you wash your feet, instead of rubbing it, rub your feet afterward to perform the last action of Wudhu according to god’s order.